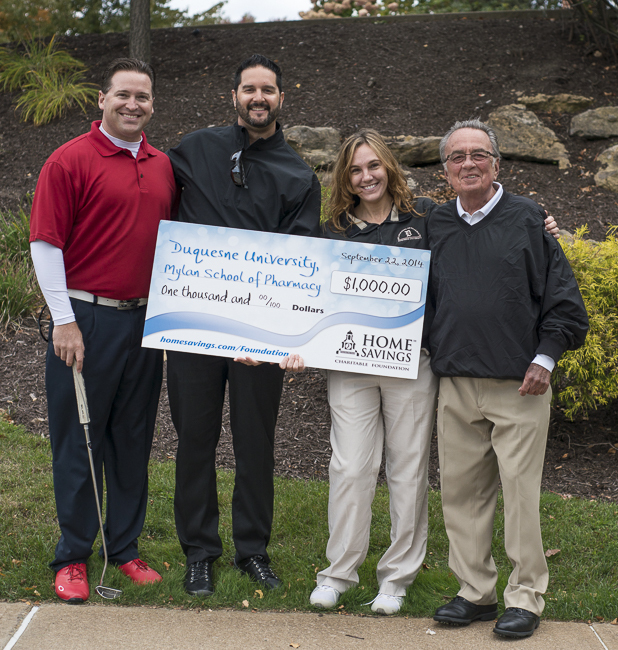 Youngstown, OH (October 17, 2014) - Home Savings Charitable Foundation has donated $1,000 to Mylan School of Pharmacy. "The funds will be used as scholarship money for the Mylan School of Pharmacy," explained Debra DiBiasi, M.S., Director of Communications, Duquesne University. "For nearly 90 years, the Mylan School of Pharmacy has been recognized as one of the most respected schools of pharmacy in the nation. Our outstanding academic program, hands-on training, and nationally recognized research leadership prepare our graduates for successful, rewarding careers, dedicated to improving the health and well-being of patients and their communities," she added. Since 1998, the Home Savings Charitable Foundation has provided nearly $12 million of support to all communities served by Home Savings. "Our focus is primarily directed toward those that serve the needs of disadvantaged children or provide educational programs, so we are proud to support the Mylan School of Pharmacy in its endeavor to educate the leaders of tomorrow," said Colleen Scott, Director, Home Savings Charitable Foundation.